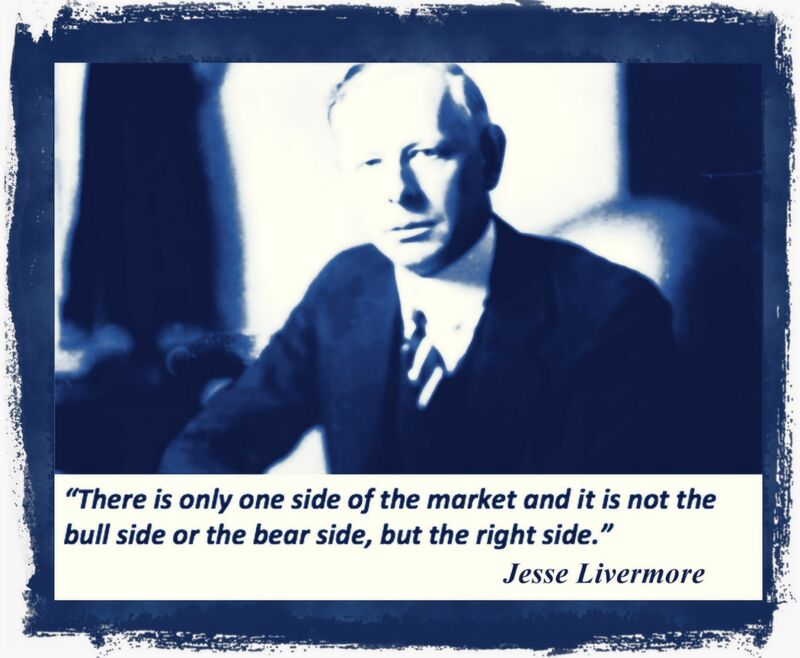 The Wisdom of Jesse Livermore, some trading lessons. Jesse Livermore led a life of brilliance and excess, surrounded by mistresses, scandals, money, and bankruptcy. He was a legendary trader who played big and made millions during the crash of 1929. But by 1934, Livermore would have depleted the $100 million fortune he earned on the stock market just five years earlier. He declared a third bankruptcy, went through his second divorce, and committed suicide in 1940 — the newspapers then detailing his scandals rather than the achievements of his earlier days. Here are seven lessons from Jesse Livermore who is considered by many as one of the greatest traders who ever lived. Lesson Number One: Cut your losses quickly. As soon as a trade is contemplated, a trader must know at what point in time he’ll be proven wrong and exit a position. Risk management should dictate the size of the trade and how much you can lose. Deciding where to exit when a position is going against you is not a winning strategy. Lesson Number Two: Confirm your judgment before trading a larger than average position. Livermore was famous for throwing out a small position and waiting for his thesis to be confirmed by it going in his favor. Once the stock was traveling in the direction he desired, Livermore would maximize his trading size for out sized wins. There are many ways to add to a winning position – pyramiding up at key pivot points, building a position as the trade goes in your favor, being 100% in no more than 5% above the initial entry – but the take home is to buy in the direction of your winning trade – never when it goes against you. Never add to a losing position. Lesson Number Three: Watch leading stocks for the best action. Livermore knew that trending issues were where the big money would be made, and to fight this reality was a loser’s game. Shorting monster stocks is a very dangerous undertaking when they are under accumulation by large funds. Lesson Number Four: Let profits ride until price action dictates otherwise. One method that satisfies the desire for profit and subdues the fear of a losing trade is to take one half of your profit off at a predetermined level, put a stop at breakeven on the rest, and let it play out without micromanaging the position. All my biggest wins were in trades where I had no price target I simply let a winner run until it reversed back through my trailing stop. This is how the big money is made in trending markets. Lesson Number Five: Buy all-time new highs. The psychological merits of buying all-time or 52-week highs are immense and shouldn’t be discounted as a part of your overall strategy. Buying a break out to all time highs out of a long term consolidation of a price range in a high growth stock is one of the best ways to make money in the stock market. Lesson Number Six: Use pivot points to determine trends. When going long, traders are continually looking for confirmation by assessing the strength of a move. Higher highs and higher lows are a solid indicator that a current uptrend is merely taking a slight pause, and the odds of higher prices are in their favor. These same pivot points are integral to drawing support and resistance lines to give traders their line in the sand. Taken together, trend lines and pivot points can enlighten a trader to a change in momentum, which may change the character of a trade. Also be on the look out for key century marks in prices like $100, $500, $700, these are psychological areas where many traders have made the decision to buy or sell. Few traders decide “if it gets to $497.23 I will sell, they think $500. Lesson Number Seven: Control your emotions. Great trading is done with the mind not the emotions. Following trends and robust systems not your own fear and greed is what makes money in the markets. And to end the post, to Average Down or Not? In How to Trade in Stocks, Jesse Livermore wrote: I have warned against averaging losses. That is a most common practice. Great numbers of people will buy a stock, let us say at 50, and two or three days later if they can buy it at 47 they are seized with the urge to average down by buying another hundred shares, making a price of 48.5 on all. Having bought at 50 and being concerned over a three-point loss on a hundred shares, what rhyme or reason is there in adding another hundred shares and having the worry double when the price hits 44? At that point there would be a $600 loss on the first hundred shares and a $300 loss on the second hundred shares. If one is to apply such an unsound principle, he should keep on averaging by buying two hundred shares at 44, then four hundred at 41, eight hundred at 38, sixteen hundred at 35, thirty-two hundred at 32, sixty-four hundred at 29 and so on. How many speculators could stand such pressure? So, at the risk of repetition and preaching, let me urge you to avoid averaging down… Why send good money after bad? Keep that good money for another day. Risk it on something more attractive than an obviously losing deal. 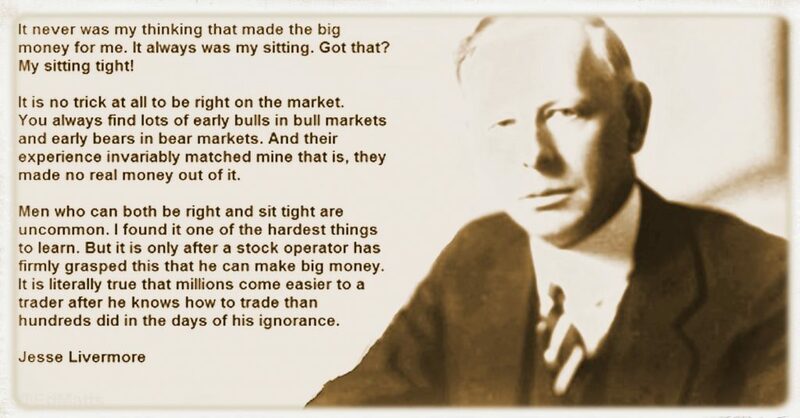 In practice, Jesse Livermore would have traded with the trend, against the “suckers” who were trying to average down. Since the stock price was falling, he would have sold it short and, as the price continued to fall, he would have pyramided his position. Every time the market moved in his favor, he would have bought a larger number of shares than he had bought the previous time.